Fluval Water Conditioner makes tapwater safe for tropical fish by neutralizing chlorine, chloramine and undesirable metals in aquarium water. Formulated with pure herbal extracts, it also visibly reduces stress in fish caused by transportation, handling and acclimatization. 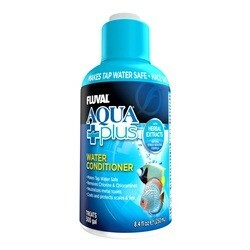 Fluval Water Conditioner also coats scales and fins to protect against scrapes and cuts.